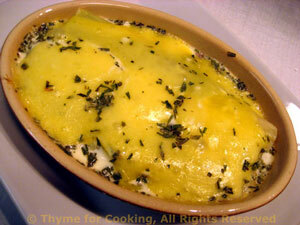 Gratin of Leeks and Ham, Thyme for Cooking healthy, gourmet starter. Cut root end off leeks. Cut tops leaving 5 inches (12cm) of white to pale green leek. Cut leeks in half the long way and discard outer leaves. Rinse under cool running water fanning the layers a bit to get out any remaining sand. Heat chicken stock and water in large skillet to a simmer. Lay leeks in a row in the simmering broth. Cover and simmer for 10 minutes. Cut the ham into strips and place in 2 individual baking dishes or one larger one. You want to be able to lay the leeks neatly. I used 2 oval dishes that were 5" (12cm) long by 2 1/2" (7cm) wide. Place 3 leek 'halves' on top of ham in each baking dish. Divide the cheese and place on top of the leeks. Mix the wine, yogurt and tarragon. Spoon around the edges of the leeks. Bake, 400F (200C) for 12 - 15 minutes, until heated through and cheese is bubbly. Remove and serve.